Cayenne Pepper, Named for the South American city of Cayenne, French Guiana, Red cayenne peppers are native to Central and South America but are grown today in many locations worldwide. Compare to bell peppers, jalapenos, and paprika, cayenne peppers also known as chili peppers, cow-horn peppers, bird peppers or red peppers. The powder contains capsaicin, a natural chemical compound that’s responsible for its spiciness and for many of its health benefits. North American Indians use Cayenne for over 9,000 years and is an important tool in the traditional healing systems of India and China. We can enjoy Cayenne peppers raw, or incorporated whole or sliced into various cooked dishes. Cayenne also commonly dried and ground for use as a spice. 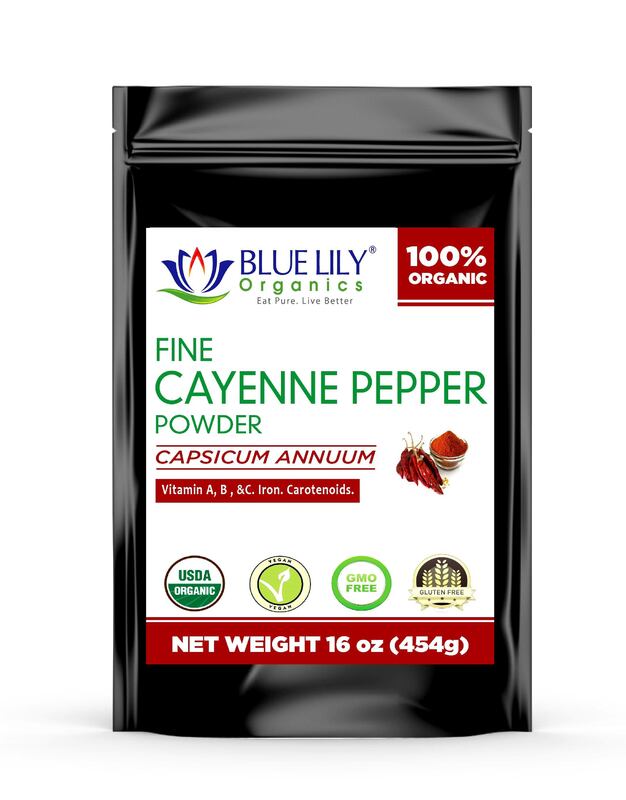 Blue Lily Organics Cayenne Powder is made from only the finest cayenne peppers, which are harvested, dried and carefully ground to a fine powder. Rich in vitamins A, B2, B6, E, C and K as well as minerals like potassium and manganese. Blue Lily Organics Cayenne Pepper Powder is a nutritious and invigorating spice. Although cayenne powder is a good source of anti-oxidants, the primary health benefits of this versatile spice are derived from its capsaicin content. Capsaicin, a potent capsaicinoid, is responsible for the spiciness and burning sensation produced by cayenne powder, as well as the many cayenne pepper benefits. It also contains carotenoids, plant pigments responsible for its characteristic red color which also possess anti-oxidant qualities. 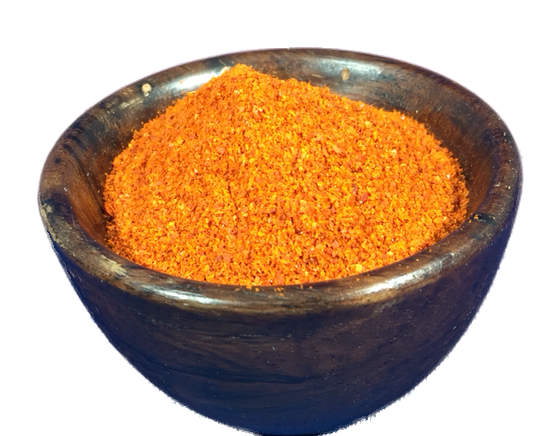 Cayenne powder is both warmings and stimulating to the body. Numerous studies show that Capsaicin in Cayenne Peppers has properties that stimulate metabolism. It may also promote healthy digestion by soothing mucous membranes and promoting the flow of secretions in the digestive tract. The warming and invigorating properties of cayenne powder also work to support the body’s natural detoxification systems. Cayenne is available in many health food stores in the form of cayenne pepper pills or cayenne pepper capsules, which many people ingest to reap cayenne pepper health benefits. When used topically, a cayenne powder may temporarily help relieve minor aches and pains. It helps to increase the amount of heat your body produces, so you can burn more calories every day. Interestingly, cayenne pepper can reduce your hunger by eating less and feeling full for longer. Cayenne pepper can help strengthen the stomach’s defenses against infections, increase digestive fluids, and deliver enzymes in the stomach that support digestion. Enjoy Blue Lily Organics Cayenne pepper by adding a pinch or two to cooked dishes, beverages, and sauces. Remember, when using Blue Lily Organics Cayenne Powder in your recipes, a little goes a long way! Great for balancing out the sweetness of salad dressings, salsas, marinades, and other sauces. Blue Lily Organics Cayenne Powder can also sprinkle into soups, meat dishes, and stir-fries for a pungent kick. Mix a small amount of Blue Lily Organics Red Cayenne Pepper with hot cocoa to make Mexican hot chocolate. Add a pinch of Blue Lily Organics Cayenne Powder to your favorite fruit smoothie for a healthful twist, to promote digestion and invigorate. 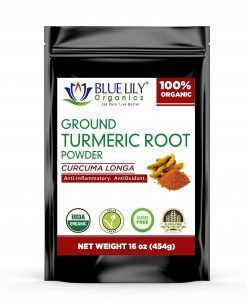 Blue Lily Organics Cayenne Powder blends well with honey and warm lemon juice to soothe a scratchy throat. Or sprinkle a pinch or two into your socks (be careful not to apply to broken skin) to keep your feet toasty on cold winter nights. Blue Lily Organics Cayenne powder is best when stored in an air-tight container in a cool, dry place. The shelf life of cayenne powder is approximately three years. 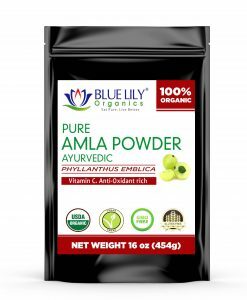 You may extend the shelf life by keeping Blue Lily Organics Cayenne Powder in a tightly-sealed container in the refrigerator. 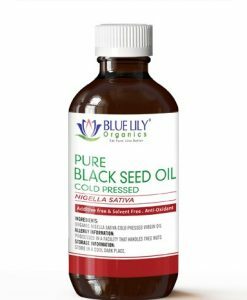 Blue Lily Organics Red Cayenne Pepper is non-GMO, and naturally-grown with no chemical pesticides. It contains no artificial additives or preservatives and is 100% USDA Certified Organic.